Milan 2011: Eindhoven designers Formafantasma present this range of plastic vessels resulting from experiments with natural polymers at Spazio Rossana Orlandi in Milan this week. Called Botanica, the project was commissioned by Italian foundation Plart, a research institute dedicated to preserving plastic works of art and design. 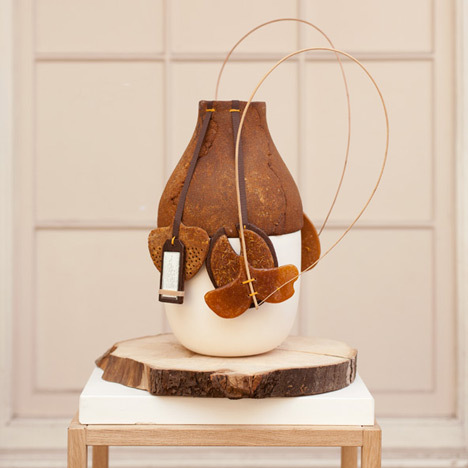 The designers experimented with making plastic from natural resins, rubbers, shellac, wood and animal products. These materials have been combined with traditional materials like wood, ceramic metal to furniture, lighting, vases and bowls that have shapes and details derived from natural forms like pine cones or seed pods. Botanica is the latest project by studio FormaFantasma, commissioned by Plart, an Italian foundation dedicated to scientific research and technological innovation in the recovery, restoration and conservation of works of art and design produced in plastic. Maria Pia Incutti, founder of Plart and Marco Petroni, curator of the project, commissioned the studio to create their own personal interpretation of polymeric materials. The perception of plastic materials has drastically changed over time. Initially considered the material of the future, synthetic polymers are now seen as the symbol of a not anymore exciting oil era. Scientific research is increasingly looking to find sustainable alternatives or ways to make plastic biodegradable. In opposition to this, the Plart foundation is addresses another necessity with its activities and research: to preserve plastic-based art and design pieces. The tension between the need to find valid alternatives to an extraordinary material, and to preserve the artworks of the last century underlines how deeply both the qualities and disadvantages of plastic have penetrated into our culture. Most of the objects we use daily are made of plastic, and though the material may take a different form, plastic will remain relevant as we move forward. With Botanica Studio Formafantasma is giving its personal homage to plastic materials by investigating the history of polymers. Botany, as a discipline, began with early human efforts to identify edible, medicinal and poisonous plants, making it one of the oldest sciences. More then two centuries ago plants started to be categorized also for their secretions, a possible source of material. The objects displayed in the Botanica collection are designed as if the oil- based era, in which we are living, never took place. Almost as if historians, Studio Formafantasma investigated the pre-Bakelite period, discovering unexpected textures, feelings and technical possibilities offered by natural polymers extracted from plants or animal-derivatives. The designers researched and hunted for information, digging into the 18th and 19th centuries, when scientists began experimenting draining plants and animals in search for plasticity. Rosin, Dammar, Copal (a sub-fossil state of amber), Natural Rubber, Shellac (a polymer extracted from insect excrement that colonize trees) and Bois Durci (a 19th century material composed of wood dust and animal blood), are amongst others, materials investigated by the studio. The organic details and plant-like forms of the pieces underline the vegetal and animal origins of the resins, while the palette of colours is based on natural amber tones in combination with traditional materials such as wood, ceramic and metal. Today, we can be said to be moving towards a new post-oil era, the pre-oil era is starting to be globally re discovered in search for alternatives. Online blogs and archives are constantly collating and updating information challenging consumers to produce their own plastics, while an American University is currently importing Russian Dandelion flowers, reigniting the lost tradition of extracting rubber from the plants roots. In line with this attitude, Studio Formafantasma looks to the past as a source of inspiration, while delivering a body of work with a contemporary twist. With Botanica, Studio Formafantasma offers a new perspective on plasticity, reinterpreting centuries old technology lost beneath the impeccable surface of mass production.